Scam!!! The word with four letters has ruined millions of lives. The new scam which have minted more than $250 million to the swindlers. The fraud came into light when the victims have approached the IRS (Internal Revenue Service) and Department of Homeland Security officials. More than 61 people were arrested in the USA and in India who are connected to this scam. If we go into the details of this scam, there were few people who maintained call centers in Ahmadabad, India who used to often target individuals who were elderly or immigrants with solid credit history, these swindlers used to get there details with their names and date of births from aggregators and marketing companies and researched the victims before preying them on. Callers from India phoned the individuals in the US and demanded that they make payments to clear purported unpaid taxes or debt to avoid arrest and they used to threaten the immigrants that they would be deported if they do not pay. The swindlers informed the victims to pay the money via pre-paid cards or their co-conspirators in the US used to collect the money and get them laundered and transferred them to India. “For nearly four years, this criminal network used a variety of schemes to trick frightened individuals over the telephone by tapping into their worst fears such as arrest, deportation and other problems with the US government authorities,” said assistant attorney general Leslie R. Caldwell. 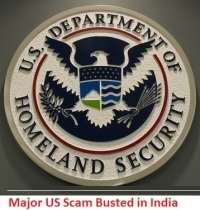 Total of 61 people in the USA and India and five call centers in Ahmadabad allegedly involved in the scam and they were charged in a Texas federal district court of Houston with the crimes including impersonation of US officer, identity theft, money laundering and wire fraud.